American Chop Suey is one of our favorites. We love crispy fried noodles with this sweet & tangy sauce. We enjoy this quite often in the Chinese restaurants in Pune. It is worth a mention that we are blessed with really good restaurants in Pune… you name it & we have it!! Most of the restaurants serve great food, priced reasonably & offer good service. They are spacious & clean as well. It is very rare that restaurants do not live up to our expectations in Pune. Today’s post is actually long overdue! I make this dish quite often at home & every time we are excited about it. This is a great one pot meal which can be fixed within minutes with a little pre-preparation. It is never boring because you can make it interesting with various vegetable combinations, include mixed sea food or even add mixed meats. Above all, it is very nutritious & healthy. In case you do not like deep fried noodles you can bake the noodles! ¼ tsp. Black Pepper pwd. Heat oil in a sufficiently large wok/kadhai till hot. Add the onions, capsicum, cabbage & sauté on high for a few seconds. Then add in the boiled chicken strips, blanched carrots, red chilli sauce, soya sauce, tomato sauce, brown sugar, pepper pwd., vinegar & stir fry for another few seconds. Next, pour in the chicken stock & water. Give it a good stir & bring to a boil. Reduce flame & let it cook for about 2-3 mins. The vegetables should be cooked till tender & should have a slight crunch. Keep stirring & add in the liquid corn flour till the sauce thickens slightly & coats the vegetables. The sauce should have a slight gloss. Reduce heat if the sauce is thickening too much. If the sauce is too thick add some water while you keep stirring. Make sure it does not turn lumpy. Adjust salt to taste. Keep the prepared sauce aside to be used later. 4 cups par boiled noodles of your choice, drained completely, sprinkle about a tbsp.of corn flour & lightly mix. Heat a wok/kadhai with sufficient oil till hot. Reduce heat to med. & fry in small batches the par boiled noodles. Deep fry on both sides till crisp & lightly golden brown. Drain completely with a slotted spoon & place on absorbent paper. Fry all the noodles in this way. To serve, either mix the crisp noodles with the prepared sauce on a plate or place some fried noodles on a deep plate preferably a soup plate. Ladle the prepared hot sauce with vegetables & chicken over the bed of crisp fried noodles. Finally top with the fried egg. Sprinkle some pepper on the egg. Add only vegetables to the sauce for a vegetarian chop suey. You may include vegetables of your choice with various combinations. Though the flavor is better with fresh stock, you may use stock cubes instead to add flavor to the sauce. For a pure Chinese taste add a pinch of ajinomoto. This is optional. 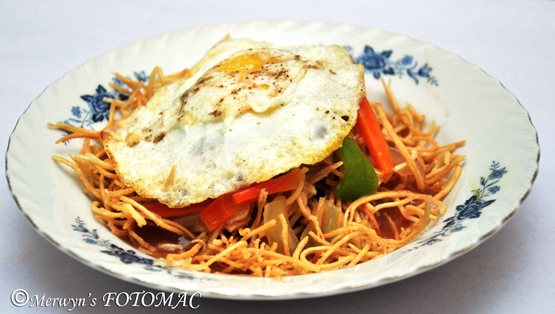 You may even enjoy your chop suey with a light plain omelette, in case you do not like your egg sunny side up. Thank you for sharing this Stir Fry Sauce. Indeed, I'm looking for a recipe that is truly healthy and delicious. I found your article has the recipes I'm looking for. I wish there were more recipes to come. Keep sharing!.